The 3.5 million ha of Eucalyptus plantations in Brazil support many domestic and industrial activities. In the pulpwood sector, forest productivity has increased from 12 to 40 m3 ha−1 year−1 through breeding and silviculturalpractices. Nurseries have fostered thisevolution with changes in container/substratetypes, propagation methods and specificinfrastructure for each plant growth phase.Eucalyptus plants are mainly produced bycuttings, using rigid tube containers filledwith vermiculite-organic compound substrates.Stock quality is based on morphologicalcharacteristics of the plants, andenvironmental conditions are highly significantfor plant performance. Performance is dependenton physiological short-term effects related tosurvival and long-term effects of genotype/rootmorphology related to tree development. Currentsilvicultural trends are reducing establishmentcosts but increasing the risk of using lowquality plants. 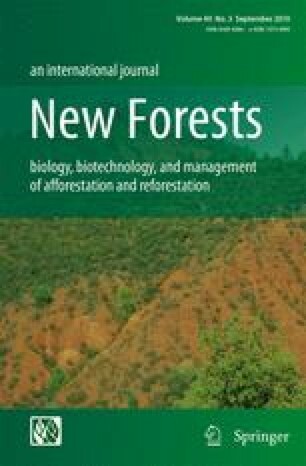 The development of fieldperformance models and nursery physiologicaltests is recommended for Eucalyptusplantations in Brazil. Improved experimentaldesigns are needed to capture the interactionbetween plant quality and field performance.